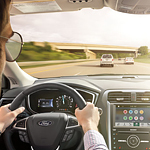 The Ford Fusion is one of the most popular cars available on the market today. This is because it has an electric option that allows you to save money on gas and lower your carbon footprint at the same time. The braking system is even designed to capture lost energy and send it back to the battery. It will also teach you how to brake in a manner that conserves energy and reduces friction. In addition to increasing fuel efficiency, it can also result in less wear on the brakes, which can save money in the long run. Driving in EcoSelect mode will also help to save energy even if it results in slightly lower performance. This can be ideal for those who are looking to eke out an extra trip to the store or to work before they need to visit the gas station once again.